People have shown the red light to the Government for not taking appropriate action against those who plundered public funds, Deputy Minister Ranjan Ramanayake said yesterday. Mr. Ramanayake, who was voicing his opinion on the outcome of the 2018 Local Government elections, said the people had shown a red light as it did not keep its word on taking action against the corrupt personalities. “The Government did not arrest anyone who engaged in robbing public funds during the earlier regime, during the last three years and the people have protested against it. Those who were accused in the Bond Scam were arrested but that was too late as it was done in the last stages of the elections,” he added. Ranjan, you are wrong. If any of the Rajapaksha family had been sent to the government. People still love the man who saved this nation. Otherwise we would all including you have been under the Elam Government. Don't try to give lame reasons for your defeat. The vast majority of people in the south has given their verdict. If you want to retain your seat at the next election now itself start to recite honazaz to the King. H.D. Guneratne, so you think an alleged rogue and murderer must lead this country? He saved the nation to ruin it later. Yes!! Ranjan should be behind YOU and push harder so your brain pushes up right where it belongs. Red light to UNP too. I agree with you Ranils gentlman ways does not work wth this politicians. This is absolute rubbish. Why would people vote for the very people yahapalanaya says are thieves! Its not because you didn't arrest them, its because you lot don't know how to run a country, make difficult decisions, you don't have a backbone, ruining the country thats why people voted you out and want MR and Gota back. They voted back to loot the country by Rajapakses. There are remaining Rajapakse memorial work. They can go on with that. So you want Gota and MR to come back to prevent ruining the country? A case of dragging ones feet until the heel of the shoes has wasted without the wearer's knowledge. A case of dragging one feet until the heels of the shoes have been wasted without the wearer's knowledge. While agitating if you try to maintain a good report with the top cadres all your attempts will be in vain. RW should step down and the most popular among ordinary masses SP should take over the the top slot. Hey we all knew SLPP going to win!!! It was matter of how big the win!! !? ?, however, if you analyze the numbers, UNP pretty much have their vote bank intact !!?? 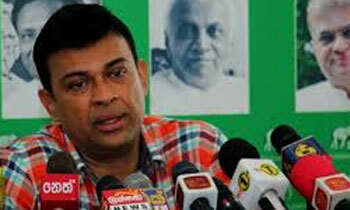 Jude, UNP voter bank is not intact. Last General Election UNP got 5,098,916 votes. Lot of them did not come to vote because of bond scam. I have expected biggest defeat than this. But UNP manage to secure it. UNP got less than the 2015 General elections. But the reasons are, several UNP allies contested separately and the people have less interest in local polls. Anyhow UNP needs some remedial action soon. Time for RW to handover the party to SP and go home - to "End"ia. Eight official trips in the last 3 years to pay obeisance to the Brahmins. Damm shame. No one addressed why MY3 had lost..!! That's because he is around with SLFP ' Kuhakayos . You tell your leader to step down and hand over the Party to a young and a reliable person. This is like a cricket team always losing and with greatest difficulty win with a different captain and again use the same captain and thinks he can win again. Its too bad now this recent match, the other captain does now play but sends a B team, the team gets thrashed badly thinking they could easily win. Unless the management is changed and those who are not performing, injury proven or old age or bad discipline records are removed they will end up in the bottom line by doing the same mistakes. At this rate, they may even lose against a Ladies team. Looking at most of the guys commenting, they are not representing “the majority of the country”. they don't understand the people's simple reason for giving an opposing verdict is "not running the country better", regardless of you punish the wrong doers or delaying them, the country must be run efficiently so that it's not going back. Of course, understandably, most of commenters are Colombo and nearby based English/Singlish speaking “MARA must go” crowed. how else can they comment...!!?? The will of the masses is final. This is the meaning of Democracy. It is clearly a red light for the parliamentary and presidential elections. People elected MS to stop corruption and bring the rogues to justice. Main reasons to reject MS and RW are,1.RW and MS’s deals with MR has prevented rogues been bring into justice, therefore people are not convinced that the MR clan is corrupted. 2.RW and MS unable to stop corruption in the current government including giving a blind eye to Wilpattu destruction. 3.RW and MS’s inability to govern properly and bringing the economy to a stand still.